Mitsubishi Electric recently introduced the new DIN sized Electronic Multi- Measuring Instrument ME96NSR. It measures and displays all important values of a Low Voltage / Medium Voltage power distribution system. With optional plug-in modules, remote I/O and open network communication can be added. The remote I/O will be used for monitoring the MCCB or ACB status or can be used for energy counters. It provides full integration into a CC-Link or ModBus network and therefore allows energy reduction and optimization by our well-known programmable controllers. 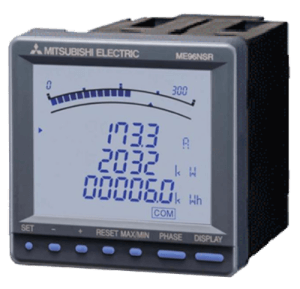 The ME96NSR measures and displays all important values of a low voltage/medium voltage power distribution system. By optional plug-in modules, remote I/O’s and open network communication can be added. The remote I/O will be used for monitoring the MCCB or ACB status or can be used for energy counters. It provides full integration in a CC-Link or Modbus network and allows therefore energy reduction and optimization controlled by a PLC. Electronic multi-measuring instruments measure and display key energy data such as electric voltage, current, power and quantity which is useful for analysis of how energy is being used in buildings and factories. Data can be relayed remotely via output, communication and other functions. In addition, these devices contribute to energy-savings through higher efficiency circuits.